Sometimes social systems get stuck. There is not enough agreement among leading actors about what is happening, or what could or should happen, for the system to be able to move forward. In such contexts, Transformative Scenario Planning (TSP) can be useful. Developed by Reos Partners, this process enables politicians, civil servants, activists, businesspeople, community members, academics, and leaders of other stakeholder groups to work together to construct a shared understanding of their system through the development of possible stories of the future, and then to act on the basis of this understanding. 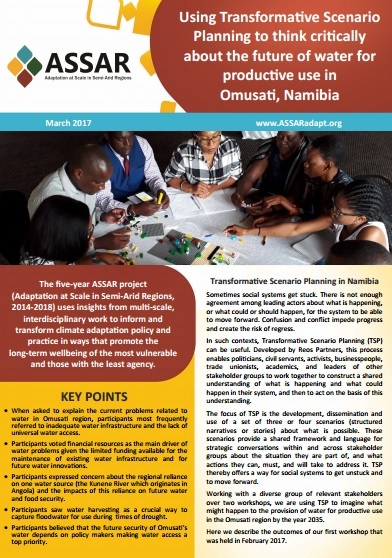 Working with a diverse group of relevant stakeholders over two workshops, ASSAR’s Southern Africa team is using TSP to imagine what might happen to the provision of water for productive use in the Omusati region of Namibia by the year 2035. In this brief, the team describes the approach and the outcomes of the first workshop (held in February 2017) where four future scenarios were developed. *Download the full brief from the right-hand column. The approach and outcomes are described in brief below. TSP workshops aim to construct a safe space where people can talk openly and honestly about complex issues in order to think differently about ways of working together. So we broke with tradition to allow interactions to foster a more informal atmosphere. People addressed one another by first name only and were invited to make use of the translator to encourage a multi-lingual forum. People agreed to keep their interactions respectful and to avoid talking down to others. To highlight the pressure of conflicting demands people shared what they had sacrificed to attend the workshop, and to begin building relationships across institutional boundaries, people shared their common interests and concerns. Although personal impacts were different, everyone shared a concern about the future of the region’s water supply. In an iterative process, stakeholders drew on their collective knowledge and experience, along with relevant film and media resources, to determine the driving forces that could significantly impact the future of water for productive use in Omusati. After coming up with 44 driving forces, the group narrowed the list down to the five of greatest concern (A). Then, after much debate, the top five driving forces were condensed into two overarching driving forces (B), which were plotted on axes to form different combinations of future events (C). Stakeholders were randomly divided into four groups to imagine what the state of water supply in Omusati might look like in 2035 under four different scenarios — as described in (C) on the next page. Composed of 7-9 people, each group used Lego models to represent the way they pictured the productive use of water in 2035 under their respective scenario. The groups then worked backwards from this future image, to think through what the critical moments might be from now until 2035. Through several rounds of feedback (from the entire workshop) and modifications, the groups refined their thinking, culminating in the beginnings of a coherent storyline for each scenario. Outlined on the next page are the building blocks that will form the foundations for the final scenarios that will be drafted during a separate meeting in April 2017. When asked to explain the current problems related to water in Omusati region, participants most frequently referred to inadequate water infrastructure and the lack of universal water access. Participants voted financial resources as the main driver of water problems given the limited funding available for the maintenance of existing water infrastructure and for future water innovations. Participants expressed concern about the regional reliance on one water source (the Kunene River which originates in Angola) and the impacts of this reliance on future water and food security. Participants saw water harvesting as a crucial way to capture floodwater for use during times of drought. Participants believed that the future security of Omusati’s water depends on policy makers making water access a top priority. In a writeshop in Cape Town, South Africa in April 2017, the draft scenarios will be refined to become more distinct and coherent. Done in consultation with the entire scenario team, this task will be completed by a subset of writers made up of ASSAR team members and volunteer stakeholders from each scenario group. These scenarios will form the foundation for strategic planning during the next workshop (July 2017) with the aim of identifying how to adapt to, and potentially influence, the future. This brief was written by Teresa Perez, with input from Dian Spear and Tali Hoffman. ASSAR, Adaptation at Scale in Semi-Arid Regions, uses insights from multiple-scale, interdisciplinary work to improve the understanding of the barriers, enablers and limits to effective, sustained and widespread climate change adaptation out to the 2030s. Working in seven countries in Africa and South Asia, ASSAR’s regional teams research socio-ecological dynamics relating to livelihood transitions, and the access, use and management of land and water. One of four consortia under the Collaborative Adaptation Research Initiative in Africa and Asia (CARIAA), ASSAR generates new knowledge of climate change hotspots to influence policy and practice and to change the way researchers and practitioners interact.